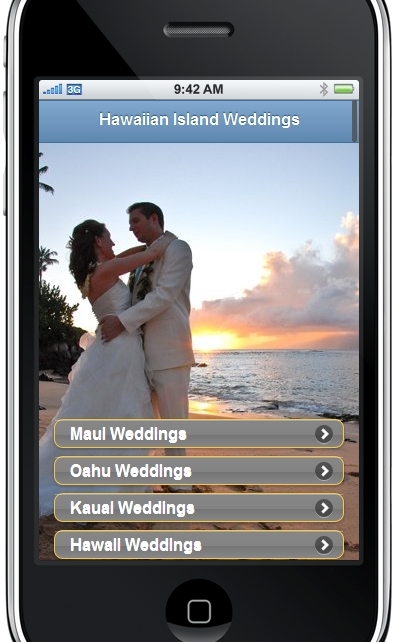 Hawaiian Island Weddings has launched it's new mobile website for iphone, ipad, android and all other mobile devices (a week before the scheduled release date!). Internet analysts say that they expect smartphone sales will surpass PC and laptop sales in 2012, with more than 450 million units sold. By 2013, smart phone sales will approach 650 million unit sales. By 2014, more people will access the internet from mobile devices than from desktops and laptops combined. That’s just around the corner! The importance of mobile is increasing daily and that’s why Hawaiian Island Weddings has been at the Forefront of Technology of the wedding companies on Maui and launched it's complete mobile mini site. The site, located at http://www.m.hawaiianislandweddings.com/, includes pricing, details and photos of all of our 36 wedding and wedding & honeymoon packages offered on all four major islands, Maui, Oahu, Kauai & Hawaii. The site also has a photo gallery, about us page and a contact form where couples can sign up for their Hawaiian Island Wedding.